«Simply a line going for a walk» presents the most recent engraving and drawing works of Joanna Latka on which the artist explores the Landscape theme, which the Salgadeiras Gallery chose for this year, following up the thematic years started in 2010. In this exhibition Joanna Latka resorts to the Dutch painting tradition in the sense of place representation and characters who make up its narrative. A low horizon line frees the plane for this series protagonist: the Landscape, delicately populated by figuration of strong expressionist essence. They're not, however, idilic or oneiric landscapes. 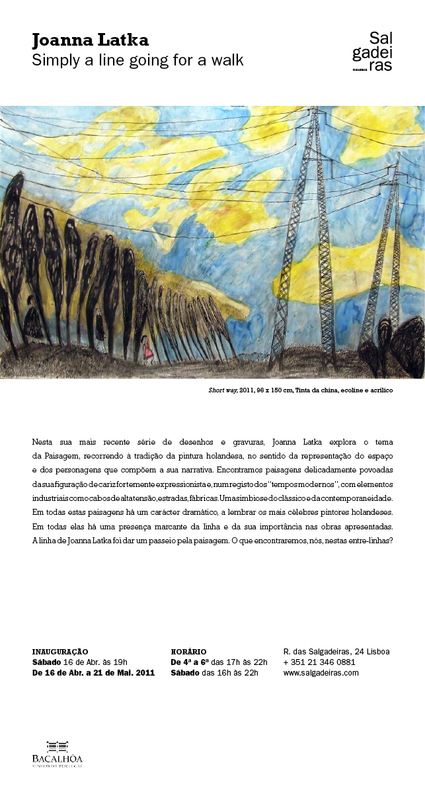 They're contemporary landscapes where we simultaneously find Nature elements: trees, clouds, and plains, and as a sign of of our times: high-tension cables, factories, and wind generators. There's in all of them a dramatic nature recalling the most famous paintings of Dutch painters. However, «Simply a line going for a walk» refers to a more formal matter explored in this exhibition: the line and the fundamental role it plays in the works presented here. Even though in distinct expressions, both in water-color and ecoline drawings and in etching/aquatint engravings, the line of Joanna Latka went for a walk in the Landscape.